It has been known for a long time that there is energy in wastewater. Nearly any wastewater has an energy value of 13-15 kJ/g COD. The organic matter present in wastewater is theoretically sufficient to more than offset all the energy used in its treatment. By employing anaerobic digestion, microbes can be used to produce biogas with as much as 55-75% methane. This is usually conveyed back to heat the digester or to produce electricity which can be utilised by the plant. Biogas, when cleaned and upgraded can serve as vehicle fuel. Compressed biogas is already being used for transportation in Sweden, Switzerland and Germany. Apart from this, where feasible, upgraded biogas can be fed into the city’s grid. In Germany, over 7,200 biogas units are connected to the grid with a total capacity of nearly 3,000MW. Unfortunately, the biogas potential from wastewater and sludge has been unexploited in most parts of the world. This is because of the large capital investment required, the complexity of putting it all together and the long payback period (usually ten years or more). Installing the systems needed to clean and upgrade biogas and the combined heat and power engines is a costly affair if the plants are small. Even where anaerobic digestion is carried out, its main purpose is to reduce and stabilise sludge rather than to make use of the biogas generated. Thus, in many wastewater treatment plants (WWTPs) around the world, biogas is simply being flared into the atmosphere. In the US, even though 1,200 WWTPs are fitted with anaerobic digestors and produce biogas, two-thirds of the plants are flaring their biogas. With methane being 21 times more potent than carbon dioxide, the impact on climate change can be imagined. And yet, wherever a spirit of innovation, cooperation and environmental responsibility has prevailed, the constraints have been smartly overcome. In Kansas, USA, one WWTP expanded its facilities in order to not only treat the sewage from nearby populations but worked together with restaurants and food processing industries to treat their fats, oils and grease (FOG) discharges. Addition of FOG waste to domestic wastewater helped to increase the yield of biogas and make its utilisation financially viable. 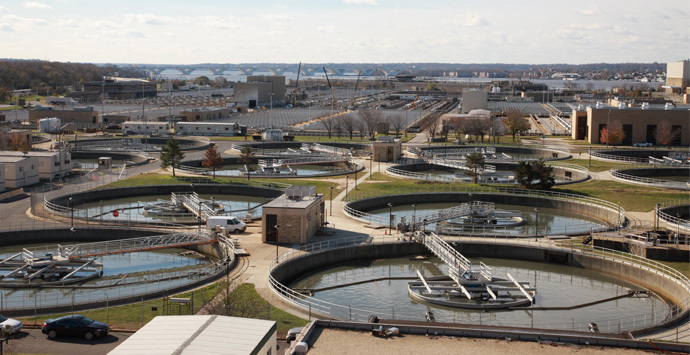 Blue Plains WWTP in Washington DC, Shatin WWTP in Hong Kong, Higashinada WWTP and Kurobe City WWTP in Japan are other notable examples where the energy in wastewater was not allowed to go waste. Innovative partnerships between municipalities, industries, lenders and WWTPs can change the entire paradigm of waste. Government incentives for renewable energy can help to reduce the payback period of biogas recovery plants. Anaerobic digestion and upgrading of biogas is far better in the long run than using energy-sucking aerobic methods for treating wastewater. Creating an infrastructure around the utilisation of biogas is far better than flaring it uselessly or going out of the way to release the carbon dioxide safely tucked in natural gas reserves below the earth. WWTPs have already shown how they can transform to water producing factories. Now they need to show some energy. Reblogged this on Creative Resources, Bangladesh. You’ve made some good points there. I checked on the internet for more info about the issue and found most individuals will go along with your views on this web site.